There are plenty of dangerous animals that come to mind when you consider the perils of the outdoors. Bears. Spiders. Rhinos. Seals always seemed to be pretty far down the list. Until now. We regret to inform you that you have worry about being bullied by angry packs of seals. According to a report by the BBC, a man was walking on a beach in Eyemouth, UK on Friday when roughly 50 seals and seal pups ambushed him. The angler naturally fled and took refuge up on a cliff. Once he reached higher ground, however, he discovered that he was stuck. He called for help, and several coastguard teams, a lifeboat, and the police came to his aid. A coastguard rescue officer was reportedly lowered to the man using ropes, and the officer then lifted the man and himself down to a lifeboat below. Thankfully, the man was uninjured, but he did suffer from minor cold exposure. 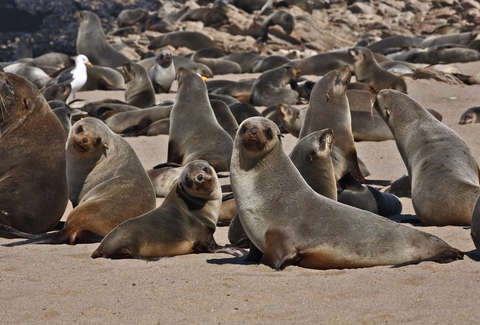 "Anyone who encounters a seal or a colony of seals on the beach or coastline is advised to move away at the first sign of agitation," said Senior coastguard operations officer Jonathan Mustard. "Aggressive seals are not a common occurrence and in this case they may have been protecting or defending their natural habitat and their young." All we can say is: Consider yourself warned.